And lo there came an ending...to my series of episodes about the 20th anniversary of Heroes Reborn! This time out I close things out on that four part flashback by going back to the first series that was put out under the Heroes Reborn initiative. 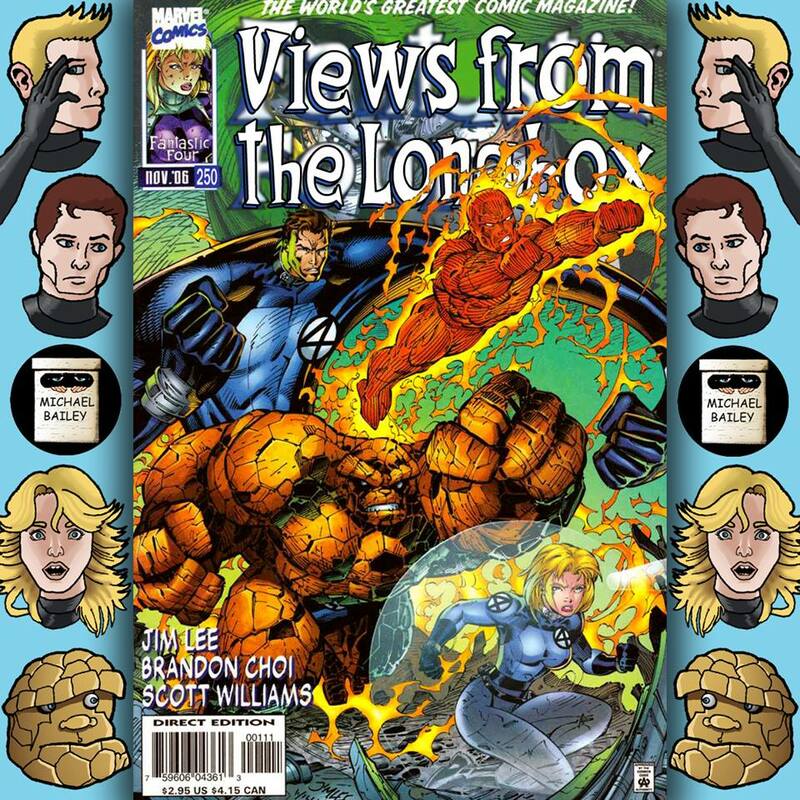 The Fantastic Four was one of the Marvel properties taken over by Jim Lee and it seems (if Internet chatter is to be believed) that it is the one book that tends to looked back on fondly or at the very least gets a free pass. To help me examine why this is I have roped in Andrew Leyland and Stephen Lacey, who just so happen to host a Fantastic Four podcast called The Fantasticast. Their mandate is to read every issue or appearance of the FF in chronological order. Currently they are in the 1970's but I managed to convince them to hop on to Doom's Time Platform and read the first six issues of the Heroes Reborn Fantastic Four series. Together we look at the 1990's take on the team's origins and their new first encounters with The Mole Man, Namor, The Black Panther, the Silver Surfer and of course Doctor Doom. We also discuss the series and Heroes Reborn in general. I wanted to thank Andy and Stephen for getting together on a Sunday to talk about this series. Be sure to use the link above to check out their site and show if you haven't already and if you like it consider contributing to their Patreon page. You get some neat bonuses and would be supporting a wonderful show that just shot past its 200th episode. While you're at it check out Andy's other shows which include Hey Kids Comics, The Palace of Glittering Delights, Listen to the Prophets: A Deep Space Nine Podcast and Keep Em' Flying: A Firefly Podcast. And if you are a fan of the Fantasticast you'll enjoy this awesome image made by Samuel Savage, who does their episode graphics! Next Time: 25 years ago a series called X-Force came out. Jon M Wilson and I talk about it. Quick warning right from the top; I usually have a PG-13 attitude towards language on this show. Certain words are okay and certain words I will bleep out. Because of how this conversation flowed there are a number of F-bombs that get dropped that I didn't bleep out. Those F-bombs were not due to the quality of the comics that are covered. They just happened and I felt that bleeping them took away from the point that was being made. So...headphones if you're at work and you may not want to play them in front of the kids if you are sensitive to such things. Anyway, my series of episodes marking the 20th anniversary of Marvel's Heroes Reborn initiative continues this time out with what is considered by many to be the worst of the four books of the line. The Avengers have traditionally been Marvel's varsity super-hero team but by 1996 they, like the other characters and teams that were handed over to Jim Lee and Rob Liefeld, not doing too well. Rob Liefeld and crew were given the keys to the mansion and the results were...mixed. Joining me to discuss this roller coaster ride of a book is Jon M Wilson and we have one of those conversations that starts out one way and in the end becomes something else. Along the way there are flashbacks, movie clips and even a classic television theme song thrown in for good measure. Jon M Wilson is the host or co-host of a bunch of other shows such as The Giant Superman Podcast, Avengers Inspirations and the New 52 Adventures of Superman. He has also resurrected Amazing Spider-Man Classics and in the next few months episodes featuring me and Andrew Leyland should be hitting the feed, which were a lot of fun to record and it's neat to be part of that show. In a few weeks Jon will be back to discuss another Marvel anniversary for this year. Next Time: The Heroes Reborn series comes to an end with the Fantastic Four! After far too many delays I finally present an episode that was meant to come out in August but life had other plans. Thomas Deja returns to Views to talk about something we've been planning to discuss for years. Specifically the John Ostrander/Luke McDonnell series that started in 1987. I've been a fan of this book since discovering it around 2000 and the fact that I get to talk about it with a good friend helps. Tom and I go through the first eight issues of Suicide Squad and discuss the team's first encounter with The Jihad, their loss against the Female Furies, a slight diversion with a guy named William Hell and then their Mission to Moscow. Rounding this octagon of awesome is a look into what makes the members of the Squad tick. You might notice that Tom sounds like he is on a land line. That's because he was on a land line. I'm really not supposed to talk about it but Tom has been on the run from the government for most of the year. We had to have this conversation on a burn phone (as opposed to a Byrne phone) and I appreciate him taking a chance by talking to me. I don't know where Tom is now but I'm pretty sure he's in a small town helping people out because he's awesome. Next Time: Heroes Reborn Avengers with Jon Wilson! I have a real treat for you this week, folks! On Sunday, September 4, 2016 I and some of the other Classics Track Irregulars had the honor of sharing the stage with the one, the only George Perez! Our subject? Wonder Woman: The 75th Anniversary! During the panel you'll hear us talking about Diana's history but mainly you'll hear about how George started working on the character and some of the highs and lows of his run. He also gives an insight on what he brought to the character and the ways he changed her for a new generation. Elizabeth Keethley: She writes stuff and is just awesome. Towards the end of the episode I mentioned that another panel I was on had been released over at the Needless Things podcast. You can check out the GI Joe panel by clicking on this link. Give the Phantom Troublemaker some love. Next Time: Suicide Squad with Thomas Deja! A somewhat regular podcast about comic books. It also might be a desperate cry for help on the part of the host. It's up to you to decide which. All images used on this site and all audio samples used in the podcast are owned by the people who control their copyrights, licensing and publishing rights. I don't own them and I don't claim to own them. They are used merely for entertainment purposes and I am not compensated for them in any way. They are there to add a little more to the blog/podcast and to illustrate the points made by the author. Thank you.